China and Russia agreed on Wednesday to further enhance political and strategic mutual trust while expanding economic and trade cooperation. The agreement came as Chinese Premier Li Keqiang and his Russian counterpart Dmitry Medvedev co-chaired the 23rd regular meeting between Chinese and Russian heads of governments here in Beijing. The meeting is the first of its kind since the two countries formed new governments and it is of great importance, serving as a link between the past and the future, said Li. He said China and Russia are the biggest neighbors in the region and provide important development opportunities to each other. Noting that the presidents of the two countries have met multiple times and the bilateral comprehensive strategic partnership of coordination has been maintained at a high level, Li said this is not only in line with the interests of the two countries and the two peoples, but also conducive to the stability of the world and the recovery of the global economy. "China is willing to work with Russia to continue deepening political and strategic mutual trust, expanding all-round cooperation and jointly contributing to world peace, stability and development," said Li. Li and Medvedev listened to reports by Chinese vice premiers Han Zheng, Sun Chunlan and Hu Chunhua, as well as Russian First Deputy Prime Minister Anton Siluanov, and deputy prime ministers Tatyana Golikova, Maxim Akimov and Yury Trutnev. Hailing the rapid development of China-Russia economic and trade cooperation since the beginning of this year, Li said the bilateral trade volume will hopefully exceed 100 billion U.S. dollars by year-end, and there is great potential in the future. 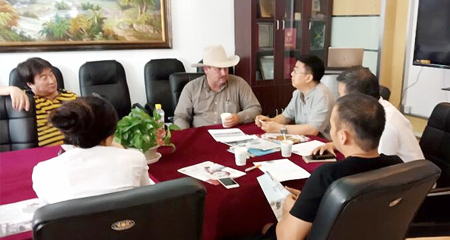 He called on both sides to further improve trade facilitation, expand mutual investment, reinforce agricultural cooperation, boost cross-border e-commerce development and enhance cooperation in areas of innovation, especially the application of science, technology and basic research. Li also called for intensified people-to-people and local exchanges as well as cooperation in areas of media, youth, tourism, health and sports. China stands ready to work with Russia to be committed to upholding the basic principles and spirit of the World Trade Organization (WTO) and safeguarding free trade and multilateralism, Li said, adding that China will synergize the Belt and Road Initiative and the Eurasian Economic Union. 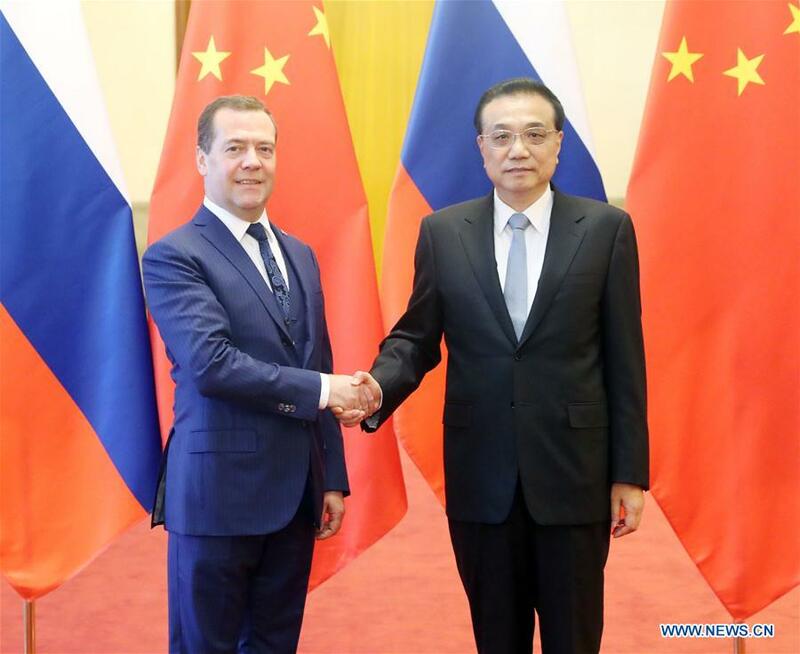 For his part, Medvedev spoke highly of the high-level mutual trust between the two countries, saying Russia is willing to intensify exchanges with China at all levels, further enhance substantial cooperation and expand trade scales. He encouraged both sides to strengthen cooperation in areas of innovation, e-commerce, agriculture, energy, nuclear energy and transportation. The two heads of government agreed to uphold multilateralism and free trade with the WTO as its core. Medvedev also called on both sides to enhance communication on the reform of the WTO and coordination and cooperation under the frameworks of the Shanghai Cooperation Organization and BRICS. After the talks, Li and Medvedev signed the joint communique of the 23rd regular meeting between Chinese and Russian heads of governments and witnessed the signing of a series of deals in areas including investment, energy, local cooperation, cultural exchanges, agriculture, quality inspection and aviation. The two heads of government also jointly met with the press following the signing ceremony. Calling the meeting "pragmatic and efficient with fruitful results," Li said the dialogue that has run for 22 years without interruption is proof of high-level and stable China-Russia comprehensive strategic partnership of coordination and bilateral cooperation in various fields. According to Li, the two sides agreed to continue exploring the potential of two-way trade and investment, strengthening cooperation in science and technology innovation, and enhancing local cooperation between China's northeastern provinces and Russia's Far East to cultivate growth points in areas of resources and agricultural products. The two sides will jointly work to put the agreement on economic and trade cooperation between China and the Eurasian Economic Union into effect at an early date, start negotiations on the Eurasian economic partnership in a pragmatic manner and lay a foundation for the building of an all-round and high-level trade and investment liberalization arrangement in the Eurasian region that will open up to other economies, Li said. Medvedev called on both sides to support cooperation between small and medium-sized enterprises and strengthen cooperation on oil and natural gas projects. Both sides expressed willingness to dovetail the China-proposed Belt and Road Initiative and Russia's Eurasian Economic Union. China's top legislator Li Zhanshu also met with Medvedev on Wednesday, calling on the two nations' legislative bodies to provide legal protection for the continued high-level development of bilateral ties. Medvedev is paying an official visit to China from Nov. 5 to 7 at the invitation of Chinese Premier Li Keqiang. During his stay in China, Medvedev also attended the opening ceremony of the first China International Import Expo on Monday in Shanghai and met with Chinese President Xi Jinping there.